This Post is Only for Test some Features. 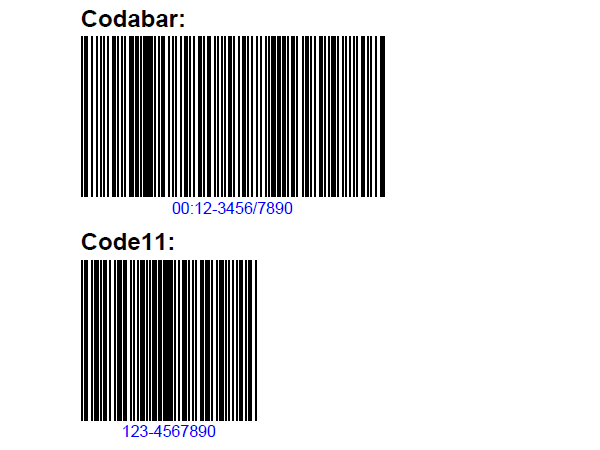 Barcode is an optical machine-readable representation of data, which shows data about the object to which it attaches. Sometimes, we may have requirements on drawing barcode into different files like PDF, Word. The first use of barcodes was to label railroad cars, but they were not commercially successful until they were used to automate supermarket checkout systems, a task for which they have become almost universal. Their use has spread to many other tasks that are generically referred to as Auto ID Data Capture (AIDC). The very first scanning of the now ubiquitous Universal Product Code (UPC) barcode was on a pack of Wrigley Company chewing gum in June 1974. PDF, as one of the most popular file formats, allows barcode embedded in. This post will show you how to create barcode in PDF document via C#. Spire.PDF is a PDF document creation component that enables your .NET/Silverlight applications to read, write and manipulate PDF documents without using Adobe Acrobat. Download Spire.PDF Here. Make sure Spire.PDF and Visual Studio are correctly installed on system. Follow the instructions below to create barcode in PDF via C#. Create a C# project in Visual Studio and Add Spire.Pdf.dll as reference. The default setting of Spire.Pdf.dll is placed under “C:\Program Files\e-iceblue\Spire.Pdf\Bin”. Select assembly Spire.Pdf.dll and click OK to add it to the project. Spire.PDF allows users to create PDF with content. Here we can create a PDF for later usage on creating barcode. With Spire.PDF, users can create different barcodes in PDF document. Follow the samples below. Compare with other popular file formats, PDF is secure to protect document from unauthorized using. But sometimes, if the author wants to use the content from his/her PDF document, it will be some kind of difficult because he/she can not simply copy PDF content and past out into clipboard. Here in this article, you will find a solution to extract text from PDF by easily using C#. Through the help of Spire.PDF, a powerful and professional PDF document creation component, users can easily use C# to extract text from PDF. Download Spire.PDF and install on system. 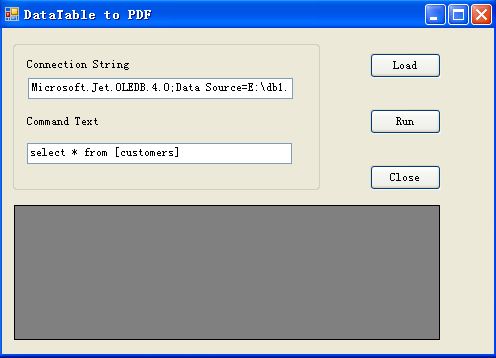 Follow the simple steps below to extract PDF text. Create a C# windows form project in visual studio. Drag a button on and add Spire.Pdf.dll as reference. The default setting of Spire.Pdf.dll is placed under "C:\Program Files\e-iceblue\Spire.Pdf\Bin”. Select assembly Spire.Pdf.dll and click OK to add it to the project. Put the PDF file which we need extract text content out from into the project folder and use the code below to load it into the project. 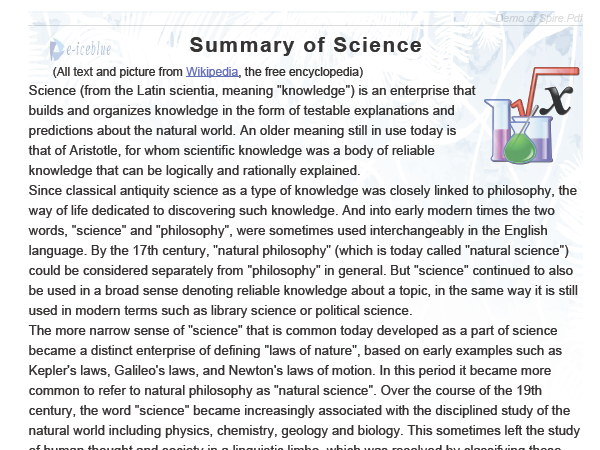 Spire.PDF presents an easy solution to extract text from PDF. Use the simple code below, we can do this job effortlessly. 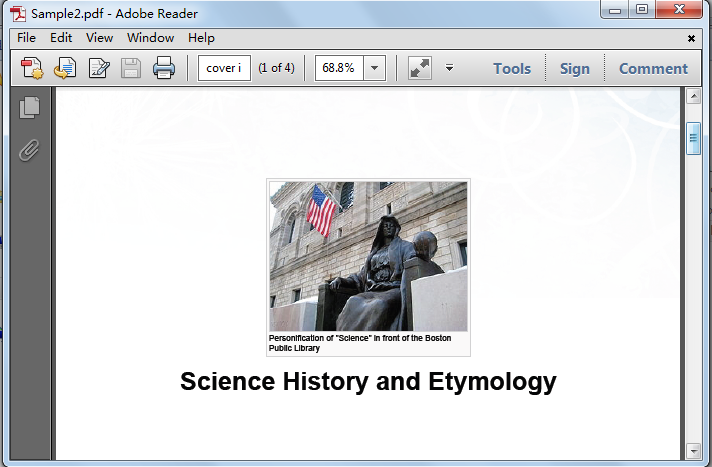 After finish extracting PDF text, Spire.PDF can help us save the text content into a .text file. Press F5 to start the project. A text file will be generated in project folder bin -> debug. Spire.PDF can also easily extract images from PDF. And it supports saving output images as most of popular image formats including PNG, JPEG, BMP, Tiff, etc. As one of the most popular file formats, PDF is great for exchanging formatted files across platforms and between folks who don't use the same software. But sometimes we may have the requirements to extract images from PDF and use them in Web pages or word processing documents. This article will show you a solution to extract images from PDF document by using C#. Spire.PDF, an all-ine-one PDF document creation component can help us easily use C# to extract image from PDF. Download Spire.PDF and install on system. Follow the simple instruction below to extract image from PDF. Put the PDF file which we need extract images out from into the project folder and use the code below to load it into the project. The simple following code can help us easily extract images from PDF. After Extract images from PDF, we need save and name the output images. Spire.PDF enables users to extract images from PDF and save as popular image format including PNG, JPEG, BMP, Tiff, etc. Press F5 to start the project. 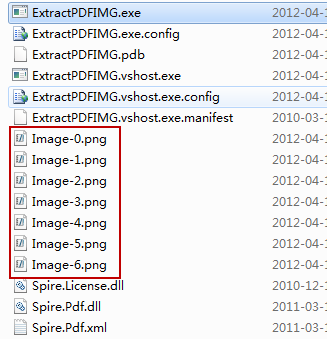 Then the images in PDF will be extracted and can be found at project folder bin ->debug. There are 7 images in original PDF file and we can find 7 images are all extracted. Insert PDF a header can help readers to get more information about the whole content with a fast speed. PDF header can be simply a title, author’s name, file’s name, a date, page numbering, short description or other text content or even an image. This post will show you how to insert PDF header in .NET with C#. This sample will show you insert PDF header with text and image both. Spire.PDF enables developers to create PDF documents at will. Here we can create a PDF document as a text document. Spire.PDF allows users to insert PDF header with both text and image. Use the code below we can easily insert PDF header with text and image. Furthermore, we can use Spire.PDF to set the text styles. At last, we can use the code below to save the PDF file with PDF header and launch the project to check the effect. PDF is recognized as the most secure and dependable format around the world. Most of us keep many of our files in the PDF format especially those that we need to send over the internet. Once a file saved as PDF format, it can not be edited. Layout, formatting, images and everything else are protected. However sometimes we have to face a problem that we may just want to share a part of a PDF to others. So people who use PDF frequently may often meet questions like how to split a PDF file into multiple documents. Adobe Acrobat supports splitting PDF document into multiple documents. 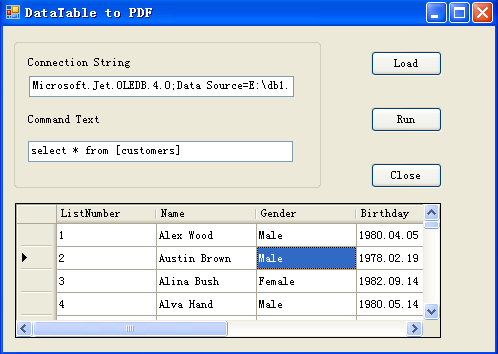 But here we will introduce another solution to split PDF document - C# split PDF. Spire.PDF can help us easily merge multiple PDF documents into one. Vice versa it can help us split PDF into multiple documents effortlessly either. Make sure Spire.PDF and Visual Studio are correctly installed on system. Follow the simple guide below to split PDF into multiple documents. We can split PDF document according to PDF pages. If a PDF document has 7 pages, we can split the PDF into 7 PDF documents. The code below can help us preview the last PDF document which was split out from the original PDF file. 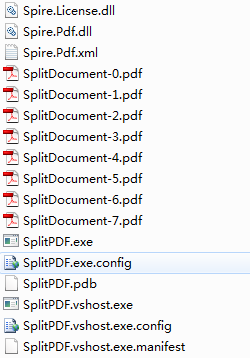 After start the project we will find out the split PDF documents in the project bin-> debug folder. This article for PDF developers is showing a method to add attachment in PDF via C#. PDF as one of the most popular file formats owns the ability to add attachments like e-mail message can carry attached files. PDF attachments are for electronic filing. They are mostly used for "hybrid files". For a PDF document previously created from a different application or a scanned document, such as a pay stub or legal property description, PDF developers can create a PDF attachment. 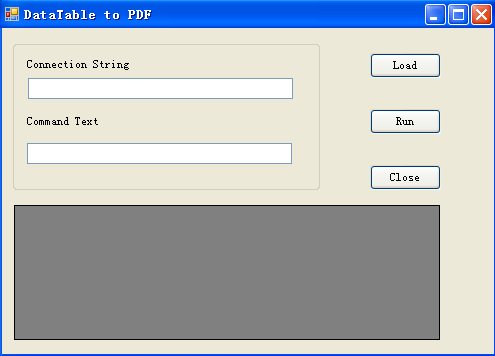 In addition, sometimes users can use PDF attachment to make PDF as a file folder. How to Add PDF Attachment via C#? Use C# to add PDF attachment can be very easy through Spire.PDF a professional .NET/Silverlight PDF component. Download Spire.PDF and make sure Spire.PDF and Visual Studio are correctly installed on system. Follow the instructions below to add PDF attachment via C#. Use Spire.PDF to create a PDF document and generate a PDF page for adding PDF attachment. We can use Spire.PDF to set margin, title, etc. The code below will guide you to add images as attachment with annotation. After finish adding PDF attachment coding, use the code below to save and preview. Then, start the project and a PDF document will be generated with attachment. Spire.PDF is a PDF document creation component that enables your .NET/Silverlight applications to read, write and manipulate PDF documents without using Adobe Acrobat. It does not use any external libraries and is built from scratch in C#. Friendly Reminder: Please make sure Spire.PDF and Visual Studio are correctly installed on your system. Spire.PDF enables to create PDF documents with customized content. We can create a PDF document and set margins for later using on watermarks. 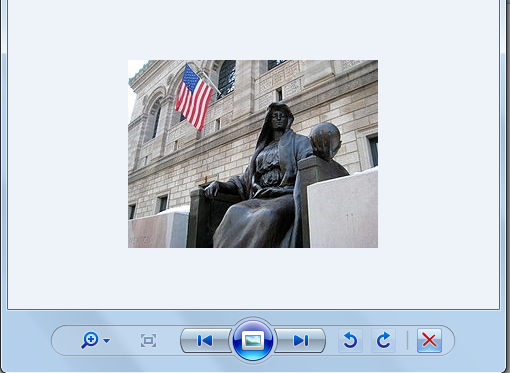 After created a PDF document, create a PDF page and then add an image to be background image and this is the image watermark. The code below can help us save the file as .pdf format and preview after start the project. Now, press F5 to start the project and an PDF document will be automatically generated.